Preheat oven to 400 degrees. In a bowl, mix the cheddar cheese and cottage cheese, then add the vegetable oil and Worcestershire sauce. Very slowly, mix in the flour. Mix until you see that the dough can easily be molded. Divide the dough into bite-sized balls about the size of a marble, then roll the balls in the chopped nuts. Arrange the balls on a cookie tray. Bake for about 20 minutes or until cheese balls are golden brown. 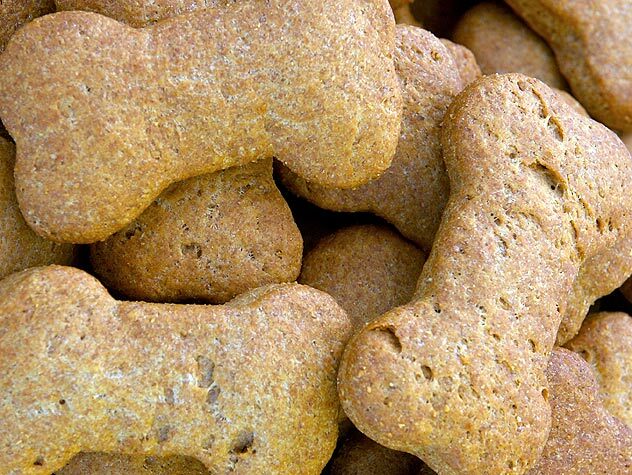 Make sure they are completely cool before giving them to your pooch, and store any leftovers in a covered container in the fridge. An easy micro waveable treat for busy people who still want to cook for their furry companions! For the micro wave: Drop by spoonfuls on a wax paper covered plate and cover with wax paper. Cook on high in micro wave for 5 to 8 minutes or until treats are formed and firm. For the oven: Drop by spoonfuls on a nonstick cookie tray. Bake at 300 degrees for about 50 minutes. Let cool completely before giving them to your pup. Store in refrigerator in an airtight container. Editor’s Note: Read the label of the baby food jars to be sure the contents don’t contain garlic, garlic powder, or onion powder, which can be toxic to dogs. Preheat the oven to 400 degrees. Put the chicken livers in a blender and liquefy them. Add the egg and blend for another minute. Pour the mixture into a bowl. Add the flour and corn meal and mix well. Spray a cookie sheet with some non-stick cooking spray and pour the mixture onto it. Using the tip of a butter knife, lightly score the surface in a square pattern to make it easier to cut after baking. Bake for 15 minutes. Cut into small squares while still warm. For safe storage, put them in a resealable container and keep them in the freezer. Preheat oven to 325 degrees. Rinse the chicken and pat dry. To make stuffing: In a bowl, combine mashed sweet potato, oatmeal, dried egg shell, and spinach. Combine rosemary, sea salt and parsley and rub on the chicken. Stuff chicken. Place chicken in a shallow roasting pan with one cup of water and one cup of either low sodium chicken broth or vegetarian vegetable broth, saving four ounces to make a gravy. Cover with aluminum foil and cook for 1 hour. Remove foil and begin basting every 10 to 15 minutes. Using a cooking thermometer inserted at the thickest part of the chicken, cook until the internal temperature reaches 180 degrees and juices run clear. Let chicken stand for 10 minutes and whisk remaining juices with flour to make a gravy. Scoop out stuffing and set aside. Once the chicken cools to a comfortable handling temperature, remove chicken from the bones and shred. Mix shredded chicken, stuffing, and gravy and refrigerate in an airtight container. Use it as a topping for dry food, or temporarily as a food replacement. *Optional: Juiced carrots and other assorted veggies. Add 1 to 2 tablespoons before each serving that way the nutrients remain intact and are fresh. *Optional: Dog vitamins pounded into a powder. Beat eggs lightly in a bowl and set aside. Heat wok or large pan over medium heat. When oil is hot, add the meat. Cook until almost done (a little pink in middle). Add rice. Stir frequently to avoid food sticking to pan. When rice is warm, add the eggs, still stirring frequently. When the eggs are almost completely cooked, add soy sauce, parsley, and garlic powder. Stir frequently until dry and somewhat crispy. It should take up to 15 minutes to cook the entire dish. Cool completely before serving. 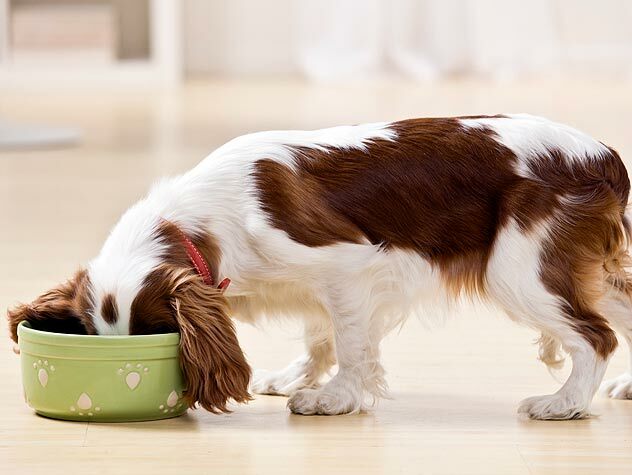 Put mixture in your dog’s dish, add the juiced vegetables and vitamins. Preheat oven to 350 degrees. In a medium bowl, thoroughly mix water, pumpkin, egg, vanilla, and peanut butter. In a large bowl, combine flour, oats, baking powder, nutmeg, and cinnamon. Mix wet and dry ingredients together and stir well. Spoon into a greased mini-muffin pan, making sure each cup is filled completely and piled high. Bake for 35 to 40 minutes or until firm (but not too brown). Cool completely and store in an open container or paper bag in the refrigerator. Makes 30 mini pupcakes. Plain yogurt or cottage cheese for icing. Preheat oven to 325 degrees. Grease and flour an 8- inch round pan. Cream butter until smooth. Add corn oil, baby food, eggs, and carrots. Mix until smooth. Gradually add flour and baking powder, mixing until smooth. Fold in crumbled bacon (or beef jerky). Pour batter into cake pan. Bake 60 to 70 minutes, depending on your oven-surface of the cake should be springy to the touch. Let cool. Top with plain yogurt or cottage cheese. Refrigerate any remaining portions. Preheat the oven to 350 degrees. In a bowl, mix the flour and milk until lumpy, then add the peanut butter and water. Mix in the parmesan cheese and then add the egg white. The mixture should have the consistency of pancake batter. Add the baking powder. Spray a cookie sheet with non-stick cooking spray and spoon the batter onto it in approximately two inch blobs. Bake for about 20 minutes or until biscuits are golden brown. Let them cool and serve ’em up!